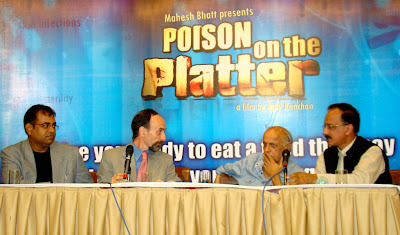 This picture is of the panel discussion that followed the New Delhi launch of Mahesh Bhatt’s documentary “Poison on the Platter.” Seated on the dias are (from left to right): Ajay Kanchan, the director of the film, Jeffrey Smith, author of ‘Seeds of Deception,” Mahesh Bhatt, the well-known film maker and I. The Delhi launch before a packed house in the Indian Islamic Cultural Centre, Lodhi Estate, happened on Feb 4. Mahesh Bhatt was asked what motivated him to produce a documentary on such a hot and controversial subject. This question in fact has been asked to him repeatedly. And every time he has pointed towards me saying that it was after one of our meetings that it made him think again and again on the need to take up the cause. Well, the credit certainly does not belong to me. It is simply Mahesh Bhatt’s humility that he names me. Actually, we had met for a breakfast a few months back in Guwahati (as Bhatt has said), where he had gone to launch another documentary. We had a wide ranging discussion on various aspects of the economy, and the politics attached to it. We talked at length about the great perseverance and courage demonstrated by an unknown, illiterate and poor Dashrath Majhi of Bihar, who spent some 25 -years to build a road through a small hill that separated his village from the nearest hospital. Every morning, Majhi would walk to the hill and sit down to break the rocks, and everyone thought this old man had become a mental recluse. He finally split the hill into two. Dashrath Majhi’s heroic feat was recognised by Chief Minister Nitish Kumar. When Majhi fell sick, he was moved to AIIMS, New Delhi for medical treatment, and when he died he was creamated with full State honours. It was during this talk that I mentioned about genetically modified foods. Mahesh Bhatt’s curiosity to understand the political economy of the technology made me explain certain nuances and the complexities associated with it, and of course draw out the bigger frame where money and big money called the shots; where science becomes subservient to financial power, and where scientists begin to look beyond good science; where regulatory system turns into a rubber stamp for the industry, and where media — more often the bigger media — starts lapping up their industrial masters. And this reminds of an interesting story. In 1994, the then Indian Prime Minister, P V Narasimha Rao, visited the United States. Like any other visiting head of the State, the Prime Minister was expected to figure prominently in the news columns of the American newspapers. After all, he was the Prime Minister of the world’s biggest democracy. During his visit, Mr Narasimha Rao addressed the US Congress, and on behalf of India, co-sponsored a resolution of the Comprehensive Test Ban Treaty with the United States. The American media however completely blacked him out. There was not even a single line on the Indian Prime Minister’s visit. For the media managers, this was a nightmare. All their efforts had fallen flat. To show the presence of the Indian Prime Minister on American soil, the media planners had no alternative, except the following: they bought a full-page advertisement in The New York Times announcing the Prime Minister’s visit. Ten years later, in 2003 to be precise, the American media went berserk over the news of a genetically modified potato, with a higher protein content, that had been developed by Indian scientists. The transgenic potato was projected as the probable answer to India’s gnawing crisis of malnutrition. Within hours of the breaking of this news, the international news wires were abuzz with excitement. Dailies like The New York Times, The Washington Post, The Financial Times, The Wall Street Journal and almost all the Indian newspapers for that matter had played up the story. The television channels had broadcast the report in the prime bulletins, and suddenly for the media the transgenic potato became a hot potato. Well, it should be clear to you now as to what makes news. Coming back to the launch of the documentary, Mahesh Bhatt was visibly agitated over the way GM foods were being pushed. He immediately told my friend Ajay Kanchan, who was also present, to take it up as a project. Ajay did the rest. The film is now released, but what is lesser known is that even the news report of the launch of the film was scuttled by many publications and TV channels. We learnt that representatives of the GM industry, which has big stakes in the introduction of the technology, had been on rounds of the newspaper offices prior to the launch convincing the managements not to publish the news report. Mahesh Bhatt however remains unfazed, and appears determined to lead the battle against the manipulation of our fundamental and basic need — food. Bt brinjal is now ready to be approved. It will be the first genetically modified food crop to be served on your plate. It is now your chance to accept it or reject it. If you accept it, don’t blame the politicians and scientists for pushing it down your throat. Don’t try to pass on the buck. It will happen only if you remain a silent spectator. Believe me, if you were to raise your voice against this unwanted and risky technology, you will actually be helping your children to live long. There will be no need then to bless them saying chiranjeev raho. If their food is safe and healthy, they will surely live long. It is therefore not your blessing but your actions that will detrmine the future of your children. Mahesh Bhatt has played his part. It is now your turn. Are you ready ? ?